After completing the classicized and folklike costumes and sets for Manual de Falla's ballet Le Tricorne in London in May-July 1919, Picasso and his mistress Olga Koklova arrived in Saint-Raphal on the Riviera for an extended holiday. In this genial setting Picasso worked on a series of still-life subjects set on a pedestal table before an open window. The chief forms in these compositions are a guitar, planar elements derived from sheet music, a compotier and a bottle. Picasso continued working on his theme upon his return to Paris in the fall. The guitar also becomes the central element in several cardboard and paper constructions, which carry this flat two-dimensional arrangement of form into the third dimension (Zervos, vol. 3, nos. 414 and 415). 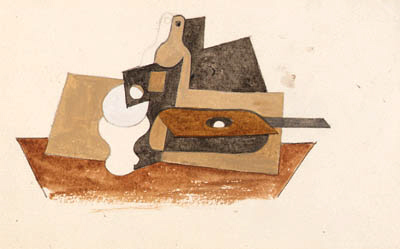 During this period Picasso was creating in no less than three different styles: late synthetic cubism, which was to reach its apex in the two versions of Trois musiciens, 1921 (Zervos, vol. 4, nos. 331 and 332); a classical style applied to folk subjects, as seen in the La Siste (Zervos, vol. 3, no. 371), which leads to the "colossal" manner of the 1920s; and still-lives and portraits in a realistic vein. Some claimed that Picasso and his new dealer Paul Rosenberg were catering to public tastes with the artist's non-cubist work. The artist, however, felt that his different styles should not be seen as exclusive phases in an evolutionary process, but as options that were available to him according to this expressive goals.